Separating from your spouse is not only an emotional time but carries with it the added complication of short term practical decisions such as: ‘Who is going to move out of the home?’; ‘Where is the person leaving going to live?’; and ‘How much is each party to contribute to the household bills while trying to negotiate a property settlement?’. Often people contact us to ask whether moving out of the home will put them at a disadvantage in respect of their future property settlement. The answer depends on your circumstances. By moving out of the home you are not relinquishing your entitlement to the property. However, if you decide to move out, your spouse will have the benefit of sole occupation of the home pending a final settlement, usually rent free, while you will have the added expense of having to pay rent and set up elsewhere. The alternative of continuing to reside under the same roof as your spouse may be extremely uncomfortable for both you and the rest of the family. Who should move out of the family home? 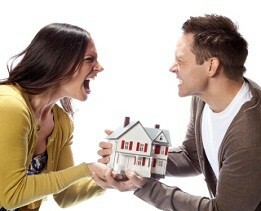 The natural reaction is to suggest that it should be the person responsible for the breakdown of the relationship! Unfortunately, it is not that cut and dry for a number of reasons, one of which is that Family Law is a jurisdiction where fault is irrelevant. So, legally, who has to move out? Irrespective of whether the house is owned by you or your spouse or you both, and provided there is no Court Order in place preventing one of you residing in the home, then neither of you has to move out. This can create a sticky situation, especially when things are tense and uncomfortable. Sometimes, despite the disadvantages of leaving the home, you may decide to move out in order to maintain your own mental health and the well being of the rest of the family. If there are young children and the living environment is hostile or unpleasant, such that it is impacting the children, then it is often in the best interests of the children for them to remain in the home with the primary carer and for the other person to move out. This would be especially true when the other person has the financial means to maintain a separate residence and the primary carer does not. However, regardless of whether you are the primary carer of the children or not, without a Court Order, there is no obligation on either party to move out. If I move out of the home who is responsible for the mortgage repayments? If the mortgage is in joint names, then both of you will be legally liable for the debt for the duration of the mortgage, no matter who is living in the property. Any failure to pay on time may damage the credit rating of you both and, ultimately, the lender may take possession and sell the property. Both of these outcomes are best avoided. Practically, if you decide to move out and you continue to contribute to mortgage repayments, then you may find that your spouse will be in no rush to resolve property matters as they have the benefit of sole occupation of the home. You, on the other hand, may be put under significant financial strain by continuing to pay the mortgage, or part of the mortgage, and having to pay rent at the same time. Firstly, as soon as you know you will be separating, you should contact your bank. If you consider that you will be struggling to make mortgage repayments because you have to maintain two residences, let the bank know immediately. Some banks may be sympathetic to your situation and may offer to quarantine repayments for a period. While this will give you some breathing space it will not be a long-term solution. 1. Continue to live separately under the same roof, try to stay out of each other’s way and continue with mortgage payments as before. 2. Move out and stop contributing to the mortgage in the hope that your spouse continues to pay the loan while he/she has the benefit of occupation. The risk is that, if the mortgage repayments fall into arrears, then you could obtain a bad credit rating or the lender could sell the property. 3. Agree with your spouse that you both immediately move out and rent the property so that the mortgage repayments can be made from the rent. 4. Move out and continue to make mortgage repayments. Be aware that this may encourage your spouse to delay resolving the property matters but a court will generally give you credit for these contributions in the final property settlement. 5. Immediately agree to sell the property and discharge the mortgage. This can provide you both with a clean break and provide you with some time to resolve the property matters between you. The proceeds of sale after payment of the mortgage can be placed in an interest bearing trust account pending resolution of the family law property matters and if necessary you can agree to release some of the proceeds of sale in the meantime to meet your day to day living expenses. Each of these solutions can appeal to separating couples in different circumstances. There are also circumstances where the Court will grant someone sole occupancy of the home. If you find yourself in this situation you should contact us to seek independent advice on your circumstances.